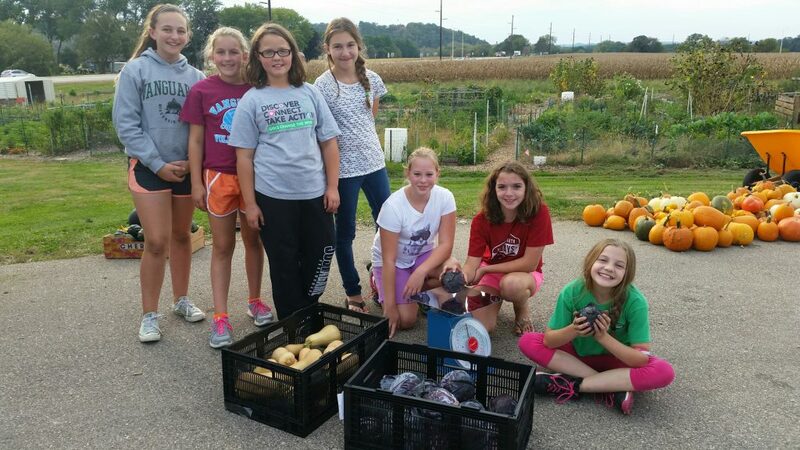 Girl Scouts weigh their garden harvest with equipment provided by Dane County Master Gardener Volunteers. 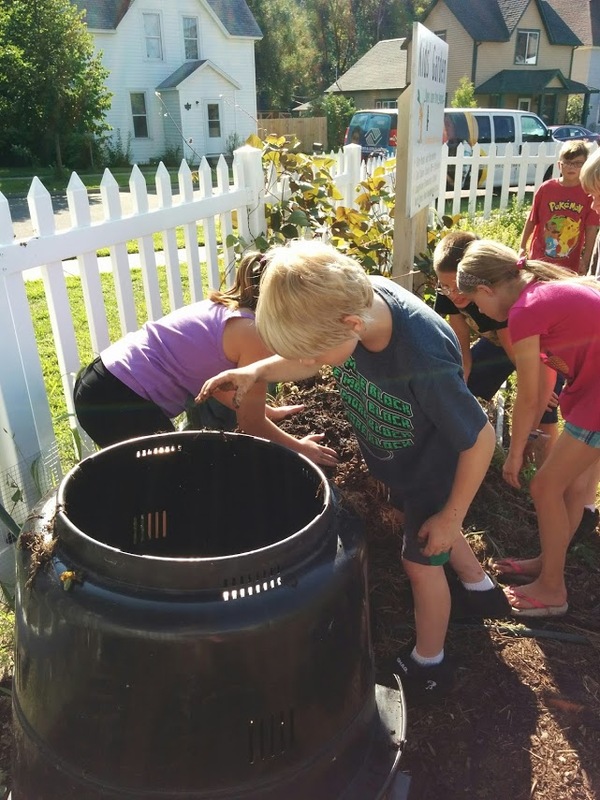 Eau Claire County Master Gardener Volunteers get kids churning compost. Students at Webster Elementary in in Burnett County get their hands dirty with the supervision of Master Gardener Volunteers. One of the most common ways MGVs directly engage others in gardening is through youth programs that teach children about growing plants. Many MGVs participate in school programs to teach students about growing and using plants. In addition to these types of school programs, many MGVs work with students in their school gardens to guide the children in preparation, planting and maintenance activities, or assist staff in school gardens that grow produce for donation or local consumption. Besides school-based programs, MGVs participate in many other youth garden programs that let the children get their hands dirty. MGVs’ work with kids isn’t just about gardening. Math, reading, science and problem solving are practiced while gardening, as are social skills, working cooperatively, listening and communicating, practicing following instruction and critical thinking. In some cases entrepreneurship is included. At Wakanda Elementary School Garden in Dunn County, MGVs lead 3rd grade classes with planting in the spring. Students got to enjoy lettuce salads before the end of school, while later-maturing produce was donated to the Menomonie Food Pantry. In Manitowoc County, MGVs worked with the local school district to design an outdoor learning classroom at Riverview School (3K, 4K and Kindergartners) where they will eventually participate in future teaching. MGVs in Door County began a cooperative program with the Door County Boys and Girls Club, providing gardening education to about 70 youth aged 6-12, including topics such as mosaics, worm farms, flower pressing, and pollinators in the garden. A Fond du Lac County MGV maintains a 2,300 ft2 “I-Spy” Garden at Pier Elementary School which challenges students to discover items placed throughout the garden. Turtles, birds, ceramic tennis shoes and school supplies are hidden among the plants beckoning the students to explore. 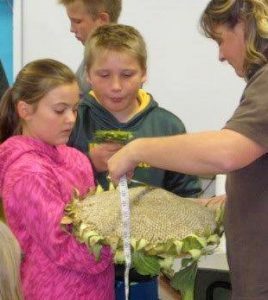 The Garden Giants Program in Price County introduces the 4th grade classroom to growing plants, and then the 5th students bring in the “giants” they grew for weighing and measuring. There is also a food tasting where students have to identify the ingredients in each of the recipes. Evaluation questions focused on STEM and required math and problem solving skills. The Spooner Elementary School Helping Hands Garden is maintained by third-grade students with the guidance of Washburn County MGVs. The classes started peppers, tomatoes, and squash from seed beginning in April. The last week of May/first week of June, the students planted the garden. The flower beds were designed by the third-graders. In addition to nutritious food crops harvested from the gardens, flowers and an abundance of tasty herbs were enjoyed. In Waushara County, MGVs partnered with local schools to teach hands-on gardening to over 160 children. Each child was provided with choice of flower or vegetable seed, along with planting medium and mini greenhouse containers. They were guided on how to plant the seed and took home their completed project along with care instructions. The Adams-Friendship Elementary School has a Student Garden where students plant and care for a variety of plants. Adams County MGVs provide assistance for mulching, planting, and maintenance throughout the growing season. MGVs taught children in the Jackson County Boys and Girls Club in a weekly garden education program at the Spaulding Road Community Garden. An average of 10 kids in each of the 12 sessions learned about planting seeds, how plants grow, and taking care of a garden. In Dane County MGVs worked at over 70 school and youth gardens to install and maintain the gardens, taught children about growing different crops or used the garden to demonstrate concepts connected with math, science, history, etc. Ruby’s Food Shelf in Siren hosted a “Little Sprouts” Mini Gardening Class for children ages 5-10 with the assistance of Burnett County MGVs. Thirty “Little Sprouts”, along with their parents, used detective skills to solve various mysteries by examining seeds and leaves of fruits and vegetables. The Kids Ranch in Rock Springs provides care and programs for at-risk children. Sauk County MGVs started a vegetable garden and a raspberry patch there, but have also incorporated growing flowers. A story hour related to garden critters, plants and soils is also provided. In Brown County MGVs shared their knowledge and experience at “Healthy Kids Day” in May where close to one thousand children and their families learned about gardening through hands-on activities. This year’s theme was on the importance of pollinators in our gardens. In Waupaca County children enrolled in the city recreation program were taught by MGVs weekly throughout the summer in the children’s gardens. Each week highlights a different topic and the children also get to work in their own garden plot. This year Columbia County MGVs took their micro-farm to four more classrooms, reaching about 230 students in four elementary schools. Students find that planting seeds and growing them for six weeks, then eating their work is a very tasty way to learn about plants. Bookworm Gardens is a free, two-acre, public garden in Sheboygan County with many smaller gardens, each one based on classic children’s stories, that is maintained and enhanced by MGVs. The books that inspire each garden are laminated and available nearby, where visitors are encouraged to read them with their children. From the Hansel and Gretel Learning Cottage to the Charlotte’s Web barn and vegetable garden, children (and adults) are transported into the world of books, plants and gardens. MGVs play storybook characters and serve on the Bookworm Gardens Board. 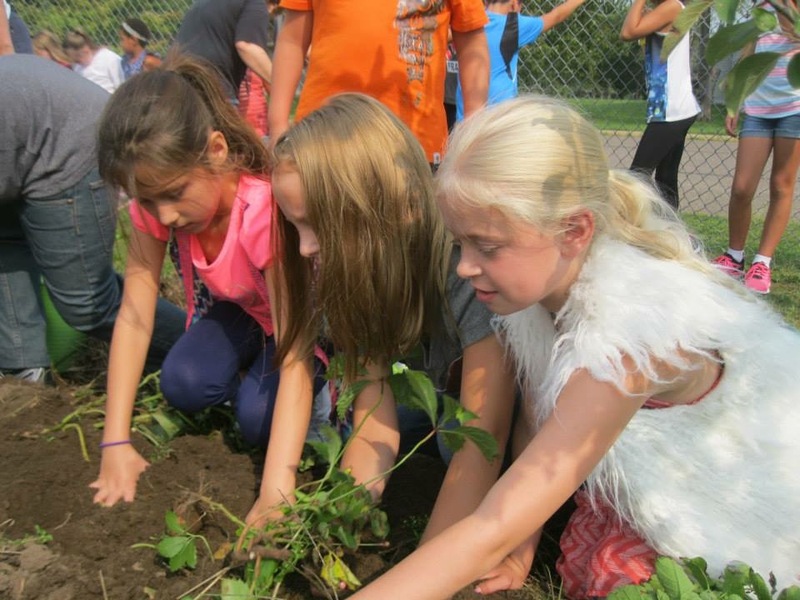 MGVs in Iron County were instrumental in reinvigorating the Hurley School garden. They built a deer fence around the garden, added and improved the storage capabilities of the garden shed, and mulched between the garden beds. In addition to improving the garden infrastructure, volunteers mentored middle school members of the Garden to Market 4-H club. The club grows produce at the garden and then sells it at the Iron County Farmers Market to raise funds for the club. The program allows the students to develop gardening and entrepreneurial skills. In Walworth County, MGV Susan Hughes partnered with the Just for Kids summer day care program to provide youth, ranging in age from 7 to 11 years old, the opportunity to engage in growing food from seed and connecting with natural resource conservation. The group met for 1.5 hours a week and participated in 12 weekly lessons that were adapted from the Junior Master Gardener Program Handbook and jmgkids.us online resources. The Teaching Garden at Columbus School in Appleton is a place where students can grow a themed garden, harvest, and use vegetables. Classroom lessons were conducted by Outagamie County MGVs with an AmeriCorps Farm to School Program Nutrition educator teaching plant parts, plant identification, plant care, etc. The children read the book Strega Nona’s Harvest and planted a garden like in the book. The seeds were mixed and scattered without rows, just as they were in the story. MGVs in Eau Claire County implemented a Teens Garden Program in partnership with The Boys and Girls Club at the Teaching and Demonstration Gardens at the UW-Extension office in Altoona. Jefferson County MGV’s work with students at several kids gardens, a middle school garden club, and local 4-H clubs. These are just a few examples of the many ways MGVs throughout Wisconsin are working with youth to cultivate an appreciation for gardening and where food comes from. Read more stories about the success of MGVs working with people in their communities on the pages in the full 2016 MG Program Annual Report.